My shoe hunt (like all my wedding-planning hunts) was a long one. I wanted shoes to match all the fuchsia in our wedding (actually, any shade of dark pink, magenta, just something bright). I was looking for low heels, gorgeous and reasonably-priced. I was out of luck. Enter costume jewelry shop. 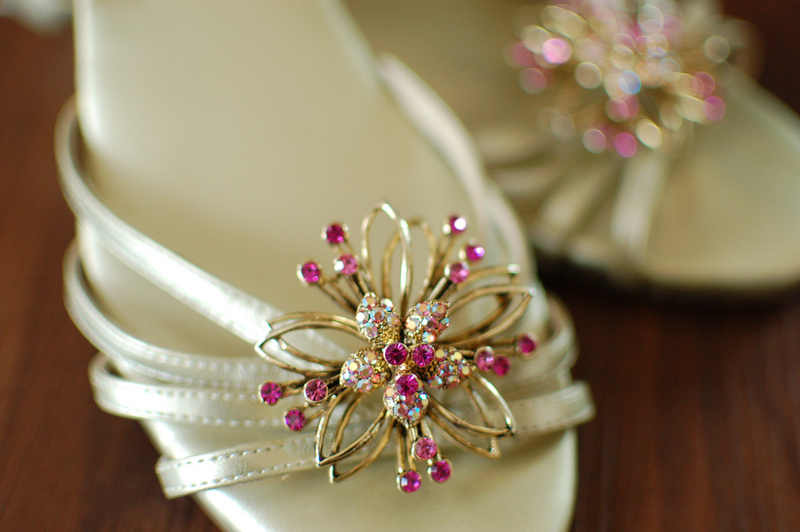 Two brooches + Target shoes = a lovely pair of sparkly, pink comfort. Not the color I was hoping for, but statement shoes nonetheless. Not only was this DIY easy and inexpensive, but I could remove the pins and wear the shoes again, for a less fancy-schmancy occasion. Another bonus: They were so comfortable that I didn’t have to trade them in for flip-flops at the reception (and this is big—I live in flip-flops)!